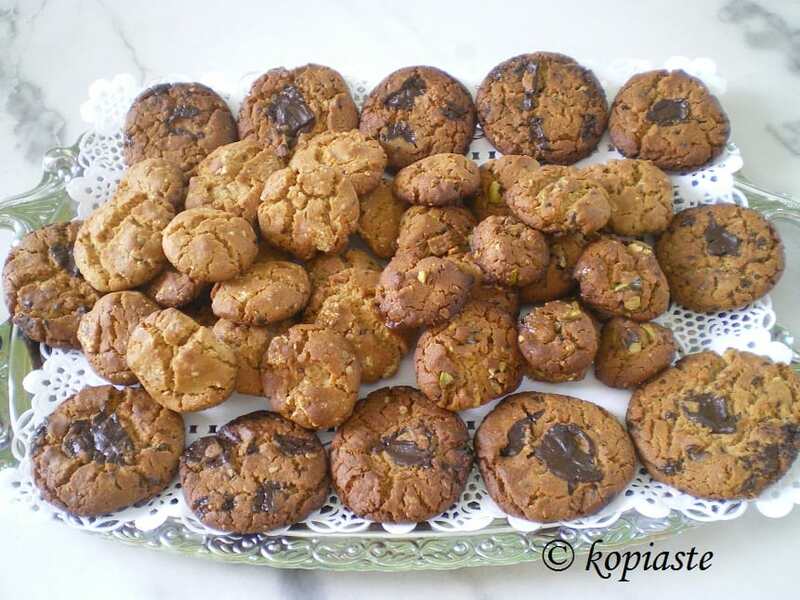 I made these delicious Honey, Peanut butter, Chocolate and Pastelli Cookies, which are nistisima (Lenten) with peanut butter, honey, sunflower oil, dark sugar and flour. After making the dough, I made three different kinds by adding chocolate and two types of pastelli in them. As I told you in my previous post, we visited an exhibition on Lakonian products. The first part was all about olives and Greek olive oil. I have taken many photos but as it is impossible to show all the exhibition, I have made a few collages so that you may see and find out about some of the local products. Hilopites is a pasta made with eggs, Kritharaki is again a pasta shaped like rise and trahanas is dried cracked wheat mixed with milk and dried in the sun to be used in the winter to make soups or pites. Paximadia are rusks. You can get them in whole wheat, regular, anise flavoured, village type etc. There were ostrich products such as sausages and eggs. Herbs like dried oregano and thyme from Taygettus. Honey and and other bee products such as pollen or wax. There were so many kinds of honey you did not know which to choose first. Honey from flowers, from coniferous trees, from herbs and best of all Thyme honey. Greek honey is undoubtedly the best honey in the world, characterised by its special aroma, rich flavour and density. One other unique product is bee pollen. I had never tried it before but as I was told it is a great source of vitamins, minerals, amino acids and more. You can eat it as it is or use it in recipes. Lakonia is full of orange groves and there are a couple of factories making orange juices and orangades. Tsipouro is a distilled alcoholic drink made from the must-residue of the winepress. In other parts of Greece, it is called tsikoudia or raki. Traditional folklore art: Hand woven carpets and other products like hand made carved wood, icons, candles etc. Traditional sweets such as diples, melomacarona, kourabiedes, samousades and pastelli, which is made from honey, sesame seeds and sugar or honey and nuts caramelized together. In the recipe that follows, I have included pastelli in it. Pastelli is a sesame and honey sweet. It can be made either with honey or with sugar. When adding sugar to pastelli, it is hard and crunchy and pastelli with only honey is softer and has a chewy texture. In Cyprus they also make pastelli with haroupomelo (carob syrup). If you want to make these cookies vegan, just skip the honey and add more dark brown sugar and add pastelli made with sugar or if you can’t find any, just add any kind of roasted nuts. A custom dating back to Byzantine times is to serve pastelli on bitter orange citrus leaves. The recipe of Pastelli is included in my cookbook Mint, Cinnamon & Blossom Water, Flavours of Cyprus, Kopiaste! I wanted to buy everything at the exhibition but as it was in the city centre, we had to go by the metro, as it is impossible to park your car without getting a ticket. So, we bought as many as we could carry back home. Among other things, I bought thyme honey, bee pollen and pastelli which I combined them in my next recipe. Bee pollen is, of course, optional but if you do find some, use it as it has many beneficial properties. I recently bookmarked a Peanut Butter Chocolate Cookies recipe from Recipe Girl. However, as we do not eat butter and eggs during fasting periods, I could not wait until after Easter to make them, so I made some changes. I divided the dough in three parts and added chocolate in one, sesame pastelli in the other and pistachio pastelli in the third. I baked the chocolate cookies first but they came out quite big so the next batch I made them quite smaller. The bigger ones were baked about 14 minutes and the smaller around 12. When baked they are still soft but after cooling they become hard. All three kinds of cookies tasted great, especially where you could get a crunchy bite of the salt with chocolate and pastelli. Some of my friends who tasted them could not believe that they did not have butter or eggs. Combine the flour, Quaker oats, lemon zest, baking powder, baking soda and salt. Whisk the oil, peanut butter, vinegar, honey, lemon juice and dark sugar until well combined. Add the dry ingredients and mix well with a spatula. The mixture should not be sticky. If it is add more flour. Cut the chocolate into small pieces and mix in the 1/3 of the mixture. Do the same for the other two pastelli. Line a baking tin with parchment paper and take a spoonful of mixture which slightly shape round. Place them spaced apart. Bake for about 12 – 14 depending on the size of the cookies. The cookies should be still soft when baked. These Honey, Peanut butter, Chocolate and Pastelli Cookies are nistisima (Lenten) made with peanut butter, honey, sunflower oil, dark sugar and flour. After making the dough, I made three different kinds by adding chocolate and two types of pastelli in them. Bake for about 12 - 14 depending on the size of the cookies. The cookies should be still soft when baked. This is my entry for Bookmarked Recipes, hosted by me this week and created by Ruth, of Ruth’s Kitchen Experiments. I would also buy as much as i can if i go to places like this. I can imagine the excitment for shopping for all these delicous goodies and the cookies look really yumm. These cookies are fabulous! A delicious treat! Wonderful produce and even more wonderful cookies. These are amazing Ivy! Thank you for trying these- how wonderful! The shopping looks like great fun! What a wonderful market! And delicious cookies! These sound so delicious and healthy as well. I avoid cooking with too much butter and these are definitely bookmarked. What Greek honey is from? Like we’re here in New Zealand, we have Manuka honey. Manuka is New Zealand native bush. Bees pollinate the flowers and farmers usually keep bees near the native bush. Other farmers usually use clover, which is a type of weeds that bees love the flowers. The honey produced is called Clover honey. In Indonesia, I just know people use wild bees in the rainforest and have no idea what they’re fed or feed themselves with. These people in the inland will then sell the honey or honeycomb along the main road, raw. It’s quite exciting, isn’t it? I haven’t tried Greek honey. Lisa, welcome I am glad to see you here as well. Arfi, the special landscape of Greece makes flora so rich, that from the 7500 different species of plants growing in Greece, 850 of them are found exclusively here. That is the explanation why certain varieties of honey (e.g. Thyme Honey) do not exist anywhere else in the world. You will have to try Greek honey to see the difference. I hopped over from Hopie’s blog when I saw your comment about Greek-style lentils. So glad to find your site! I’m wondering, are the lentils you mentioned the Fakes Moutzentra recipe? Greek-style lentils sounds so delicious to me. I would love to make them. Ivy, lovely post. The products all sound so special. Thyme honey is my favorite–especially from Kalymnos!! I’ve tried others as well and the last two summers that I haven’t been able to visit Kalymnos, I have been bringing back thyme honey from Lefkada. Bravo Ivy! Another wonderful post detailing your visit to the Lakonian products expo! Thanks for sharing this, and the cookies look great! That’s mind boggling, Ivy. And so much is new to me. 🙂 You must have had the time of your life at the exhibition and shopping. I liked these unusual cookies too. Fabulous photos Ivy, and your cookies look delicious. Divya Vikram’s last blog post..Think Spice.. Think Pepper Roundup! Great recipe! I’d never made homemade peanut butter cookies before (I always used a Betty Crocker mix and found them excellent), but these were great! Parnonos Honey is the best Greek honey I have ever tasted! I brought back this honey to the U.S and whoever has tasted it is asking if there some way to get it. Wow Ivy! That’s mind boggling and so much is new to me. You must have had the time of your life at the exhibition and shopping. Thank you so much for sharing this awesome post.